(Natural Society) Shark sightings along America’s coastlines made headlines this summer, and 8 people died after having unfortunate encounters with the fearsome beasts worldwide. 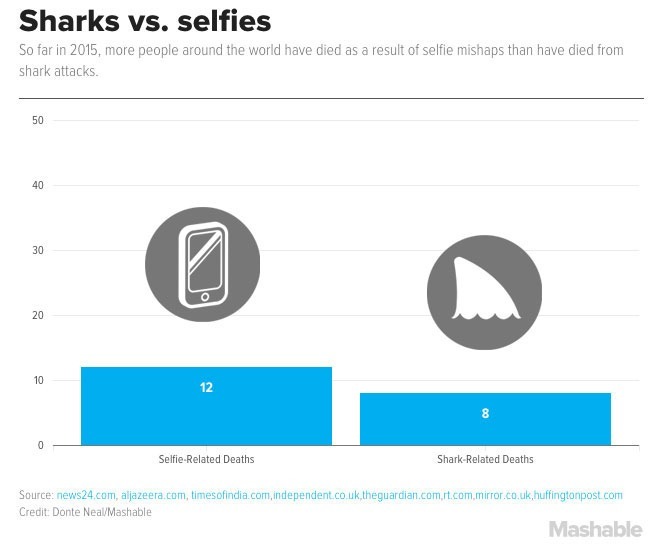 But a new report shows that taking selfies proved to be more deadly than shark encounters. The 12th person to die was a Japanese man who tumbled down some steps while taking a selfie, which induced a heart attack. Hideto Uedo, 66, was believed to be taking a photograph at the Royal Gate when he lost his balance, and his life. Australian tourist Kristi Kafcaloudious fell some 200 meters to her death while trying to snap selfies near a rock face in Norway. A Singaporean tourist died while trying to take selfies at a bull run, and – perhaps most shockingly – two young men in Russia blew themselves up in January while they took selfies with a hand grenade with the pin pulled out. A Russian teenager also died after he came into contact with live wires while trying to scale a railway bridge in the Ryazan region. 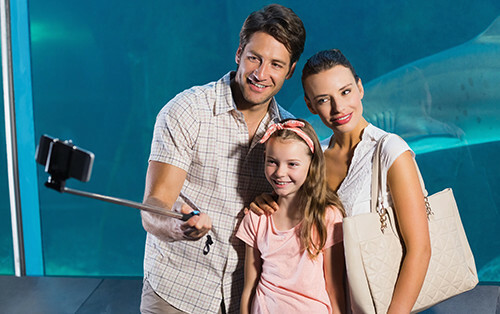 Ironically, no one has died this year while trying to take a selfie with a shark, but it’s only September. The report notes that, in addition to people trying to snap selfies at bull runs, some parks have closed due to visitors trying to take selfies with bears. And even Tour de France cyclists fear for their safety because of brain-dead spectators trying to get in on the action with their smart phones. The leaflet advises readers not to take a self-portrait with a gun or a lion. You know, just to be specific. Under-thinking and being illogically zealous seem to be the trend nowadays. Phones have so much radiation in them that they seem to bypass our logical, analytical, and recall thought process. Along with GMOs, genetical engineering/alteration technology, toxic petrochemical substances in the air, and irrational spraying of health-damaging aerosols to the atmosphere, how far will man-made creations must progress until we realize that we’ve been living wrong? We need to work with nature and not artificially alter it. Or as stupid as the majority of your comments. Yeah, that’s why you decided to follow me around the internet for the past few weeks–because you think my comments are so “stupid”…. Yes I need a good laugh every now and then and you are the perfect moron to provide them. You wish, idiot. Now go back under your bridge like a good troll. Is that really the best you can do? How sad. Well, considering the best you can do is follow me around like a psycho, I’d say I’m one up on you. At least. I see counting isn’t one of your strong points either. Your stupidity never surprises me. looking at public information isn’t stalking. If you are to stupid to set your profile as private that is your problem. It’s considered internet stalking or harassment when you do it every single day or every time you think I might have made a comment somewhere on Disqus–and that’s exactly what you do. I’m not a coward so I don’t hide my comments. I don’t need to because I have nothing to hide, unlike yourself. Listen up, troll-boy. I don’t have a problem “conversing” with you in articles related to GMOs since that’s obviously your “thing”. I’m NOT going to go on like this with you in articles that have *nothing* to do with conventional ag. You have not contributed anything of intelligence to these other articles and you’re only making yourself look REALLY stupid and desperate. I baited you into this comment section and you went for it. So thank you for proving my point. Now go back to the GMO articles and quit following me around like a psychopath. You seem very controlling, could this be from your childhood issues?